Home > RC Hobby > Motor Battery Packs > 2700mAh Ni-MH Battery Packs, 7.2v - 14.4v, for RC electric, etc. 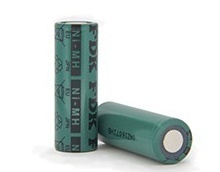 2700mAh Ni-MH rechargeable Battery Packs for RC electric. Made with FDK-SANYO 2700mAh "HR-AU" cells. Cell size 0.67" dia. x 1.97" tall (slightly fatter than a AA). Made to order from 7.2v thru 14.4v. Choose Pack Voltage, Shape, and Connector from drop-down menus. These battery packs are made to order fresh, right here in the USA! 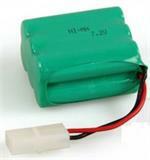 9.6vTYCO: 9.6v 1800mAh NiMH battery for RC toys. Includes TAMIYA connector. Size: 4" x 2.25" x 0.67". Long life, memory-free, rechargeable. 6HR-AAU-CT: 7.2volt 1650mAh Ni-MH battery for Multiplex easystar. 6-pack "C" shape with Tamiya connector. Pack size: 2" tall x 1 5/8" across x 1 1/8" deep. 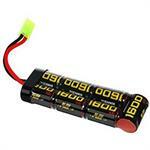 EP1600MP: 1600mAh NiMH battery packs for RC electric. Choose Voltage, Shape, Connector. 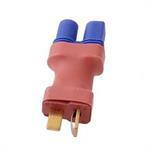 Available from 7.2v thru 12 volt. Cells are 1.1" tall and 0.65" diameter. 6BK-3MCCA-CT: 7.2volt 2000mAh Eneloop Ni-MH battery for Multiplex easystar. 6-pack "C" shape with Tamiya connector. Arrives to you PRE-CHARGED & READY TO USE ! 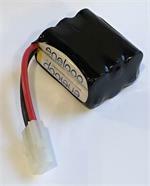 BK-4HCCAMP : 950mAh ENELOOP PRE-CHARGED NiMH battery packs for R/C electric. Made with Panasonic eneloop NiMH cells. Ideal for models with small electric motors (7 Amp draw or less), or transmitters that require AAA cells. Pricing starts at $35.00. 5EP5000SCR-TJR: 6.0v 5000mAh rechargeable Ni-MH battery for HPI Baja 5T, HPI Baja 5B.